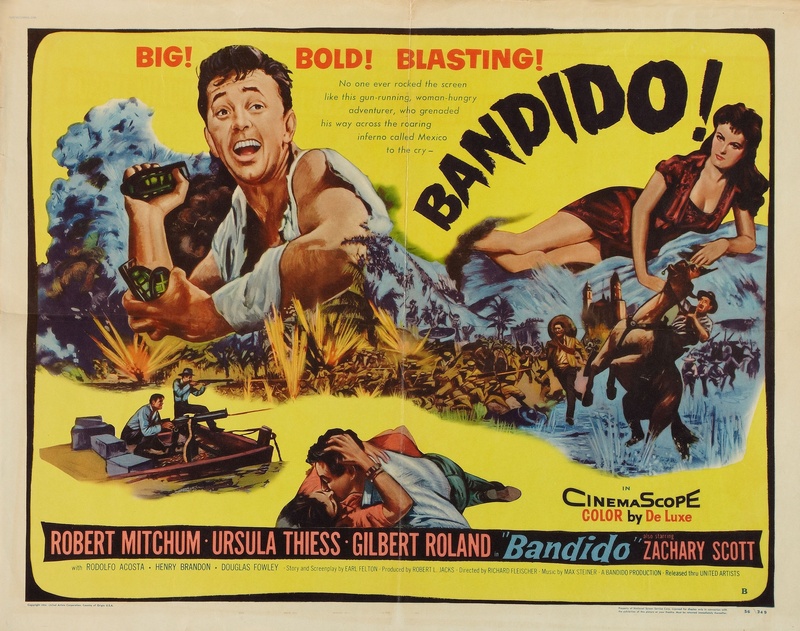 BANDIDO — In 1916 revolutionary Mexico, a mercenary hijacks arms for the rebels, and develops a yen for the arms dealers wife while he’s at it. 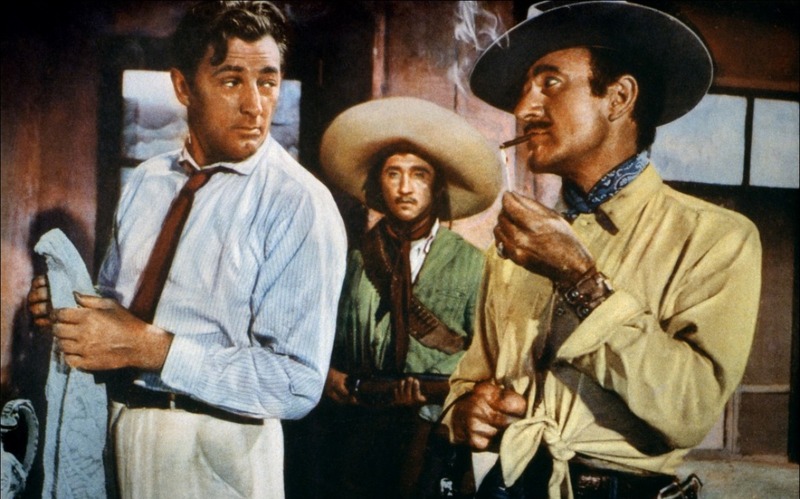 Enough plot description—now add Robert Mitchum, Gilbert Roland and a slew of real-deal Mexican locations. Direct it with zip, give it CinemaScope, let Max Steiner loose on the score. Have the guns go off in every direction. Arriba! A dandy south-western, courtesy of Richard Fleischer, a hit & miss director: this overlooked action packer rates as one of his goodies. Mitchum is perfect in a role that for him is both standard and classic–the wisecracking, cool, resourceful tough guy with a weak spot for decency. Gilbert Roland is–well, he’s just so virile, so guy-to-pound-back-Tequila–shots-with, so marvelously Mexicano. Not a lot of skipping in this playground. Lots of action in a quick 92 minutes, with an exciting, large-scale opening battle in a city, between the Federales and the Villistas, topped by a great bit that has observer Mitchum casually tossing grenades at the government soldiers from the balcony of his hotel, all the while holding a Scotch in his hand. Off-the-cuff flair like that guaranteed a take of $4,700,000, shooting the locks into 64th place for the year. With Zachary Scott, Ursula Thiess, Henry Brandon, Douglas Fowley and that great bad-guy fixture of many a western, Rodolpho Acosta. Among the other production difficulties was a comical but dangerous incident when Michum’s stand-in got into a cantina brawl and a missed haymaker knocked out a pretty senorita. She happened to be the mistress of a high-ranking Mexican cop, and angry officials seized the negative of the film until things got calmed down. A goofy tagline for the advertising declared “THE CRY THAT ROCKED THE WORLD’S HOTTEST STRIP OF HELL!! !” Where’s that Cuervo?